The New Humanitarian | Can organic cotton save the industry? Can organic cotton save the industry? Global organic cotton production grew by more than 150 percent to 145,000 metric tons in 2008 – an estimated 0.55 percent of total cotton production, according to the US-based non-profit Organic Exchange, which promotes and monitors organic agriculture. Though West African cotton growers produced only about two percent of this amount, this was double the region’s yield of 2007. But the global financial crisis has posed a “headache” for promoters of organic cotton, said Jens Soth with the Swiss NGO Helvetas, which promotes farmers’ livelihoods through organic agriculture. Despite the grim economic outlook Soth said he is optimistic that the organic market can withstand a downturn. He said Helvetas’s buyers, including the US-based Victoria’s Secret lingerie store and Swiss companies - including cotton trading firm Reinhart, retailer Migros and textile group Switcher - have not cancelled their orders, but demand has levelled. One of West Africa’s top cotton exporters, Burkina Faso became the world’s 10th largest organic cotton producer in 2008 with 2,000 metric tons, double the amount of the previous year, according to Organic Exchange. While organic cotton commands a higher price than non-organic, it might not be worth the trouble, the head of Burkina Faso’s cotton producer association told IRIN. Traoré said it is becoming increasingly difficult to stay competitive because producers in India “have started undercutting organic prices.” Burkina Faso producers of organic cotton earn about 50 US cents per kilo. Profits have also been lower than for conventional cotton because even though farmers earn up to 30 percent more per kilo, yields are less than half on average, Traoré said. Pesticide-free cultivation requires crop rotation and manual weeding and fertilising, which limit cotton production, according to the cotton association president. Smaller yields are to be expected initially when switching to organic cotton, according to a 2008 comparison of organic and conventional cotton in Mali by Canada’s University of Moncton. Researchers wrote that because organic cultivation requires crop rotation, which decreases the land available for cotton, it can take at least four years before new crops and improved soil fertility compensate for the loss in income. But even if there is a short-term shortfall in profits, the researchers wrote, the long-term health and environmental benefits from non-chemical cultivation outweigh any losses. The researchers concluded that over the long term, as long as cheap labour is available chemical-free cotton farming is more profitable than conventional cotton, can decrease rural poverty by employing more women and can improve soil management. In Benin some 1,500 producers produced 500 metric tons of organic cotton in 2008, according to the country’s Organisation for the Promotion of Organic Agriculture. Helvetas’s representative in Benin, Evelyne Sissinto, told IRIN high fertiliser and fuel prices plus environmental degradation have started pushing farmers into organic production. She told IRIN organic cotton production is about livelihood as much as it is about agriculture. "Helvetas offers cotton producers a minimum guaranteed price and families no longer have to go into debt to buy expensive fertilisers and pesticides." Helvetas pays farmers up to 59 cents per kilo, in addition to providing organic certification, training and follow-up help, according to Sissinto. While thousands of farmers have begun producing organic cotton in West Africa, the majority of the region’s cotton farmers still grow conventional cotton. 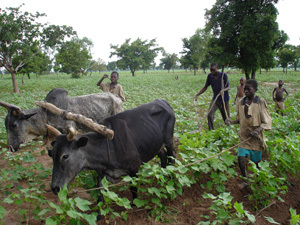 In Burkina Faso 350,000 farmers practice conventional cotton farming and slightly fewer in Benin, according to the countries’ trade groups. Organic producers form 0.1 percent of growers in both countries. The UN Food and Agricultural Organization has named 2009 the International Year of Natural Fibres to help promote a sector that has typically brought in $40 billion annually - mostly in cotton earnings - but has shrunk in recent years because of losses in the conventional cotton sector.